WoW Throne of Tides Shipping Tuesday (Oct. 11)! The new World of Warcraft expansion, Throne of Tides, is expected to ship next Tuesday, October 11th! Order by Monday, October 10th to receive our lowest prices! We will be raising our booster box price from $93 to $94 and our booster case price from $1069 to $1079 (12 boxes) on Monday. Booster boxes will include 36 packs for the first time! 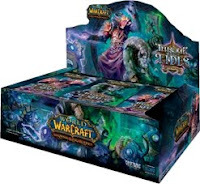 Throne of Tides Epic Collection is also available for $29/box or $336/case (12 boxes).